Superannuation funds are at the vanguard of a new dawn in savings and retirement. According to research, the size of the superannuation market could reach $8 trillion by 2035, a quadrupling of assets in less than a decade. This brings new challenges and opportunities across all facets of superannuation: investment, management and regulation. FS Super is at the forefront of that discussion and forward-thinking. 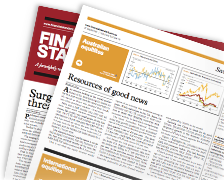 This publication will feature the latest news, industry developments and academic research that will help the superannuation professionals of today make their mark in the superannuation of tomorrow. Stay connected. Take the lead. Read FS Super. Start receiving our quarterly magazine by becoming a Premium Subscriber. Go Premium.